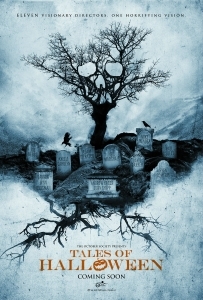 Tales of Halloween (2015) is the latest stab by well-regarded horror directors at the anthology format. Created by Axelle Carolyn, the intent is to replace the V/H/S series as a showcase for filmmakers whose names will be very familiar to genre fans. Avoiding found-footage like the plague, Tales of Halloween is a slickly presented and often correctly ultra-violent homage to the one night of the year when all things supernatural and horror-themed are celebrated. If it lacks genuine chills and frights, this collection of ten terror yarns makes amends by providing a wealth of laughs, jubilant enthusiasm for all things horror cinema and spirited interpretations of old tropes and traditions. The gorgeously animated pop-book style opening credits sequence and connecting bridges set the tone well and the use of Adrienne Barbeau, as a voiceover narrator in the style of a DJ, mimicking her famous role in John Carpenter’s The Fog (1980), strikes another note of intertextuality that Tales of Halloween feeds and thrives off. Opting for a very-1980s inspired visual palette complete with bursts of Argento-like primary colours, John Landis and Joe Dante are perhaps the biggest ‘masters of horror’ contributors to appear as actors, but there are cameos and small parts too for Barbara Crampton, Lin Shaye, Adam Green, Lisa Marie, Pat Healy, Stuart Gordon, Alexandra Essoe and more. The strongest individual segments are directed by Carolyn, Mike Mendez and Neil Marshall. Lucky McKee’s Ding Dong is very funny and Pollyanna McIntosh camps it up brilliantly as a frustrated wicked witch, but the concept is more focused on the practical effects and hindered by fast cutting. Mendez’s deconstruction of slasher tropes, titled Friday the 31st, sees a lumbering, deformed maniac chasing the final girl figure through the woods, but encountering an alien beamed down to our planet for a spot of trick or treating, then turning the tables on the killer yokel. Carolyn’s Grimm Grinning Ghost is the solitary piece to create classical chills, and it’s the only short that’s actually scary. Essoe, who wowed earlier in the year with festival favourite Starry Eyes, plays a young woman making her way home from a Halloween party and being stalked by Mary Bailey, the ghost of a woman who cuts out the eyeballs of anybody unfortunate enough to cross her path. Along with Marshall’s wonderfully silly Bad Seed, about a genetically modified killer pumpkin roaming the streets, they’re the cream of the Halloween harvest crop. Film4 FrightFest 2015 runs from 27-31 August. Programming, ticket details and all information can be found at www.frightfest.co.uk. You can keep up with our coverage here.